It’s officially time to bring out those summer colors! 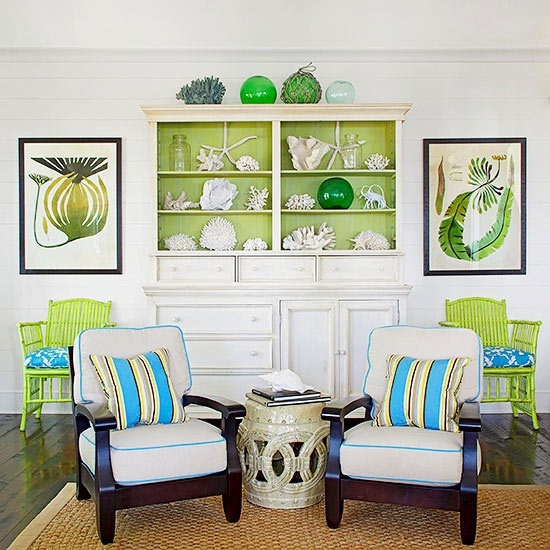 Summer is all about color and you can easily bring color into your home! When we think of summer we think of the beach, being outside and of course the sun. How do we bring these colors into our homes? It’s easy! Decorate with plenty of blues, greens and yellows! That’s not to say that you can’t use other colors if you want though, we all imagine summer in different colors.Want to throw some pinks or purples in the mix? Go for it! Check out these beautiful spaces and use them as inspiration to get your home looking like summer! This week our Tuva-Luv comes from Emily! One of her store favorites is the homart bone china monogrammed jug! This exclusive collection of refined, yet affordable, home accessories are created for everyday use from all-natural, recycled and new materials. Showcasing the handwork, the HomArt collection evokes the warmth and serenity of a less-hurried era. A special assortment of bone china containers cast from a collection of vintage glass bottles and jars. Each piece is a small work of art and painstakingly reflects every detail of it is original counterpart from the precision of the measurement lines on the 16-ounces medicine bottle, to the perfect shoulders of the monogrammed jug, to the indented grips on the jar lid. Shop the homart bone china monogrammed jug now! Find all of our Tuva-Luvs and more on the Tuva-Luvs Page! 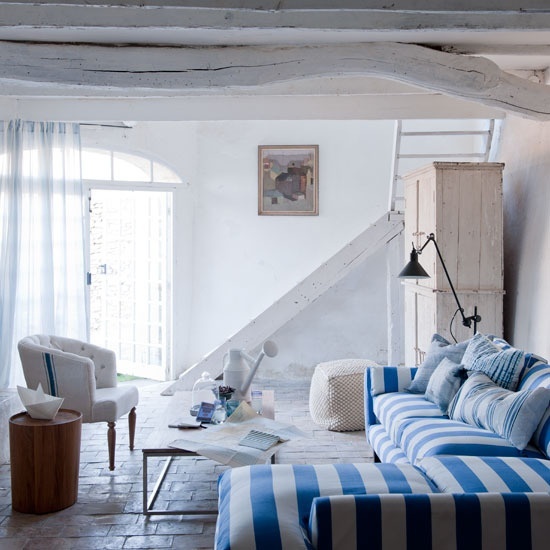 We’re love spaces that are designed with blue hues! Not sure if spring has completely sprung and we’re rapidly jumping into summer mode or if it’s the permanent coastal love affair between the style and the color, but we’re really into it! 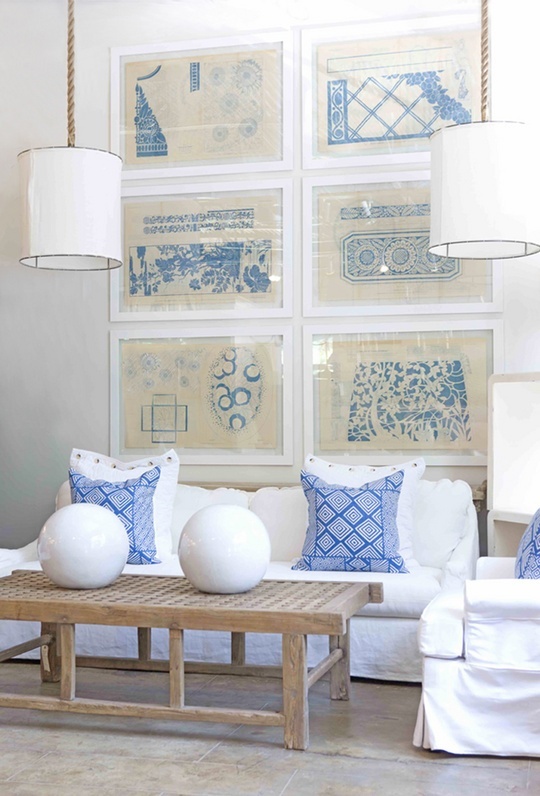 Blue is a color that is refreshingly simple that welcomes you with open arms and says, “Come in and relax. You are home.” Can you think of a better way to start or end the day in? Imagine every time you come home and you’re transported away in tranquility. Okay, we know we’re a little carried away, but can you blame us?? No way! As we all know, we can talk about beautiful homes and spaces all day, but sometimes, you have to leave the heavy hitting to the pictures. So kick back and enjoy these wonderful spaces, because we definitely are! Everyone’s favorite season is rapidly approaching. The sun is shining, the beach is starting to beg you to come play and the birds are chirping away trying to convince you to go outside. As much as your body and mind might be ready for summer, is your home? If you’re not sure, then use these 3 tips to help your home in the direction of summer! 1. Dust off, clean up or replace the outdoor furniture. If we plan on getting that beautiful, golden tan or hosting a BBQ (or two or three) this summer, we’re going to need the furniture to lend us a helping hand. Take a quick look at your outdoor furniture. How’s it looking? Do you need new cushions? Does it need to be cleaned? Or is it time to ditch it for some new furniture? 2. Bring out the marshmallows. Get that fireplace ready for those gooey, delicious s’mores! It’s not summer unless you’re ending your nights around the fire and roasting your marshmallows for the classic summer time treat. No place to roast those marshmallows? No problem! It’s time you get that fire pit and set it up. These are easy to shop for and there’s no need to build one or lay brick! It’s time to let the air flow through your home! Open those windows wide and let the summer breeze fill your home! This lets you keep your home cool and gives those indoor plants a little fresh air as well! Are you ready for your Monday coastal home pins?? Because we’ve got them! 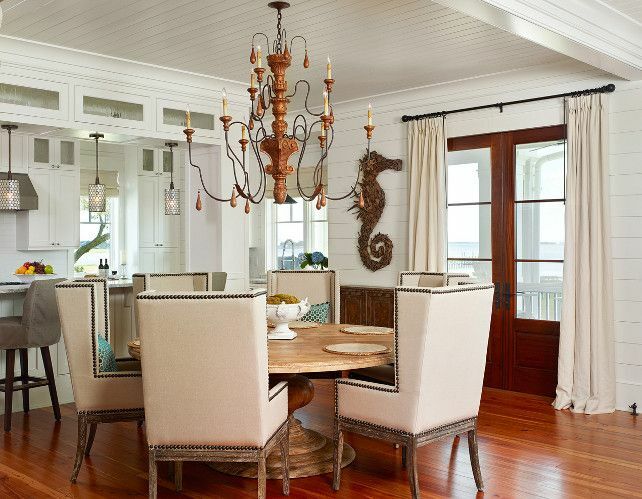 Here are five coastal inspired homes ready to hit your coastal decor Pinterest Boards! So you know what to do, ladies and gentle! Pin ’em and share ’em! Have a good week and happy Monday! Do you want more coastal inspired pins and home decor? Then head to the Tuvalu Home Pinterest! This week our Tuva-Luv comes from Dana! One of her store favorites is the barr-co. natural wax candle! This candle is hand crafted with pride in the U.S.A. Made in small batches with soy and vegetable waxes grown in the heartland by American farmers. Each candle is also signed by its artisan. Pick up the barr-co. natural wax candle online now! Want to know more of our team’s store favorites? Then head over to the Tuva-Luvs Page! Pedestal tables offer a lot more than meets the eye. They offer more space, both in actual table top space and seating options, and give everyone a seat at the table. That means everyone gets enough room and there isn’t an awkward person trying to lean in to be a part of the conversation. A pedestal table is nice change of pace from traditional dining table options. They help out in those tight spots by creating extra space and give you a little wiggle room in the corners. These tables, like most tables, come in two sizes: large and small. A large pedestal table is great way to entertain more than two to three people. They offer the space you need and give everyone the opportunity to comfortably interact with one another at the table. For those of you with small nook or kitchen space, you’d be more interested in a small pedestal table. They seat two to three comfortably and create a person and intimate experience while filling the small amount of space provided. Take a look at these great pedestal tables below! See how they are used and how the designers placed them in the space! 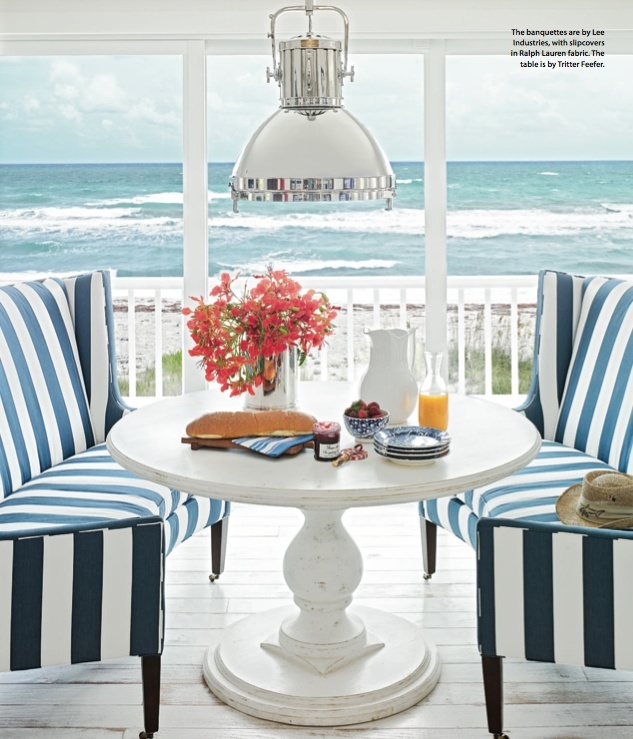 It’s Monday and we have your coastal home decor pins ready for your Pinterest boards! That’s right! 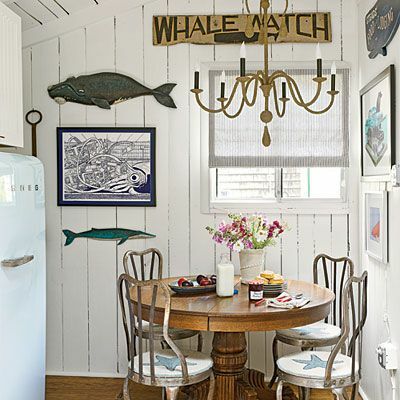 Five more ready to pin photos that will go perfectly with the rest of your saved coastal design pins. Get those pin buttons ready, ladies and gentlemen. Pin ’em and share ’em! Have a good week and happy Monday! 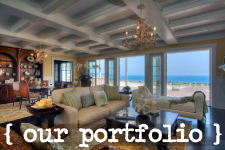 Do you want more coastal home decor and design inspired photos? Then head on over to the Tuvalu Home Pinterest!